The technological revolution with World Wide Web has compelled an increasing number of writers and even publishers to choose the option of eBook conversion as a most effective medium for reaching out to their target audience. eBook alias electronic book is the digitization of a printed book into an electronic digital format. Some special book reading gadgets or apparatus like kindle (Amazon), Sony Readers, Ms readers, EPUB, DNL reader, Apple iBook store, the Google eBook store, Nook (Barnes and Noble) are required for reading the eBooks. Now it's also compatible with Apple products such as iPhone and iPads. An eBook can also be read on computer or laptops by means of the online html version. eBooks are electronically downloaded through a web site or as an attachment to emails with PDF version. Many readers are utilizing iPads to read eBooks. Amazon.com has made an application for the iPad facilitating iPad users to read Kindle books on their Apple device. 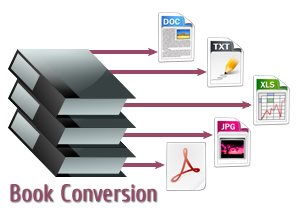 The process of eBook conversion for iPad generally engages the steps to convert a source file into the EPUB file format. The iPad is also being able to read other file formats like TXT, DOC, MOBI and AZW. Adobe Acrobat software converts word processing documents into eBooks with Portable Document Format (PDF) and the PDF document is virtually compatible with any computer - MAC, PC or any other platform. Calibre, a free open-source project, is the combination of iTunes-esque library-management program, one part batch-conversion tool, and one part file-transfer manager. Calibre can easily manage the eBooks and make them readable with any reader. In order to preserve the eBook over long period of times ASCII or HTML format is an ideal medium. The reader can avail the plain-text or PDF format by applying a text browser as instance w3m or programs such as html2ps. Publishers are benefitted as eBooks can be generated easily, involve small in terms of investment and cause profit margins of 50-95%. Readers are benefitted as huge numbers of eBooks are available free of cost. Other eBooks charge marginal rates for its reader. Besides eBook are easily accessible. Once become accustomed to the eBook format, it is easy to download and collect payments from online bookstores. The greater storage capacities provided by eBook devices guarantee that these eBooks with their ompressed sizes do not involve the same amount of space as any ordinary book. The multipurpose eBook websites provide translation facility to the reader for converting an eBook in different languages. The eBook acts as a promotional product same as advertising. The low cost of production and distribution makes the eBook a striking substitute to other forms of advertising. Global Associates can provide outstanding eBook conversion, creation and optimization service at most economical charges to provide a technologically advanced digitized version of information accessible in print or simple digital format exclusive of changing its content, structure or styling in any manner. Global Associates utilize Optical Character Recognition (OCR) technology to convert & optimize the scanned document into editable text and receive 100% correct file from these printed scanned material. After scanning and OCR is completed, we will produce a Word document maintaining formatting parameters like indentations, alignment, paragraphs, margins, page numbers, headings, quotes, footnotes/endnotes and citations to keep the originality of the source document. Preservation of images and other internal graphical elements, tables and charts, footnotes and endnotes are also kept. We can also add new features like video and audio, embedded PDFs, non-linear tables etc. Global Associates can undertake all kinds of printed books, paper-based data, web based articles and manuscripts as well as paper based articles for conversion. The final output is provided in fully electronic format such as e-book, ezines, e-brochures, e-research papers and e-journals that can be uploaded on the web after converting them into HTML pages. Global Associates can also convert existing PDF file into an ePDF file format. All eBooks generated by us are validated and fulfill all set standards and principles for submitting to any recognized online stores like Amazon or iBook store. Just send us your manuscript and Global Associates will convert your document to digital E-reader formats.